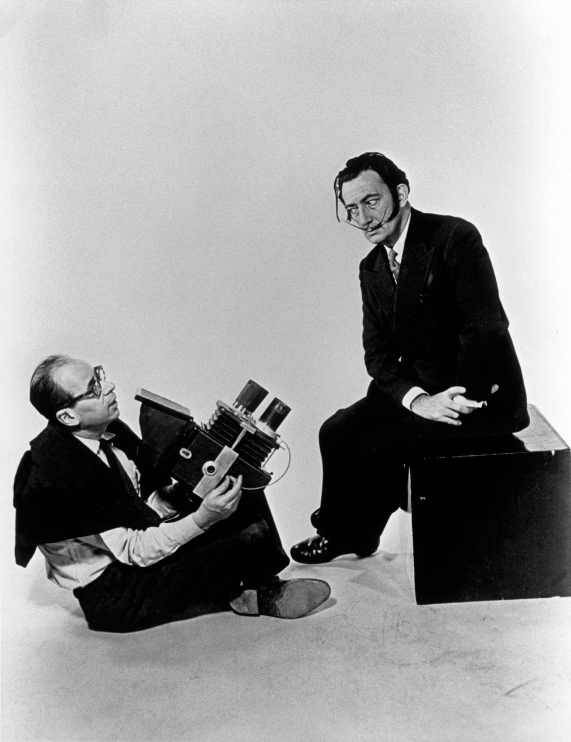 Philippe Halsman and Salvador Dali lived and worked in Paris in the 1930s, when surrealism flourished. But they first met in New York in 1941, when both were new émigrés. They had arrived within months of each other – Dali in August 1940, and Halsman three months later. During the previous ten years, their paths must have criss-crossed frequently in the narrow streets of Montparnasse, where Halsman had a studio at 22 Rue Delambre, and Dali was part of the surrealist enclave at 54 Rue du Chateau. In 1936, Halsman exhibited photographs at the Galerie de la Pleiade, where surrealist photographer Man Ray also showed his work. But until 1941, Halsman and Dali had never met. Within a year of his arrival in New York, Halsman had re-established himself. His iconic portrait of model Connie Ford silhouetted against an American flag had been featured in a major Elizabeth Arden advertising campaign. In April, 1941, Halsman was assigned by the Black Star Agency to photograph the installation of Dali’s exhibit at the Julien Levy Gallery. Halsman’s relationship with Dali deepened in October, when he photographed the outsize costumes Dali created for the Ballets Russes production of “Labyrinth” at the Metropolitan Opera House — with music by Franz Schubert, choreography by Leonid Massine, and scenery and costumes by Salvador Dali. Lacking a large studio, Halsman took the company’s prima ballerina, Tamara Toumanova, and another dancer dressed as a giant white rooster, to a nearby rooftop. When Halsman photographed bird and ballerina against the soaring towers of Rockefeller Center, he produced a photograph that evoked one of Dali’s own sharply-focused, surreal works of art. The photo became LIFE’s “Picture of the Week,” the artists became inspired friends, and their creative rapport would last for the next 37 years. Usually they conspired in Halsman’s large, strobe-equipped studio at 33 West 67th Street, around the corner from St. Nicholas Arena in Manhattan. Other “sittings” took place at Dali’s home in Cadaques, in Los Angeles, and at the St. Regis Hotel, where Dali invariably stayed when he was in New York. Their intense, prolific, 37-year collaboration is unique in the history of 20th Century art.